I am often asked my opinion about the "best" toys for kids. "What should I buy my toddler for his/her birthday?" "What should my child entering kindergarten be doing in her free time?" "I want my kid to play but also be learning something!" Guys, I know. I find this to be a nearly impossible question to answer adequately, as young kids are all so different, with varying interests and needs. Moreover, something appropriate for a two-year-old is very different than a toy or game for a four-year-old. That being said, I really sat down to think about the top recommendations I feel comfortable delivering to parents and inquiring gift-givers. This list is in no way comprehensive and based purely on seven years of practice as an early childhood educator. I tend to believe that less is more when it comes to toys. Children truly don't need a lot to learn and discover: in fact, I stand behind my opinion that the most popular toy of all time for a toddler/preschooler is an oversized, empty cardboard box. So, there's that. ONE: Masking Tape. Yes, tape. I always have several large rolls of colored masking tape out in my classroom writing center. 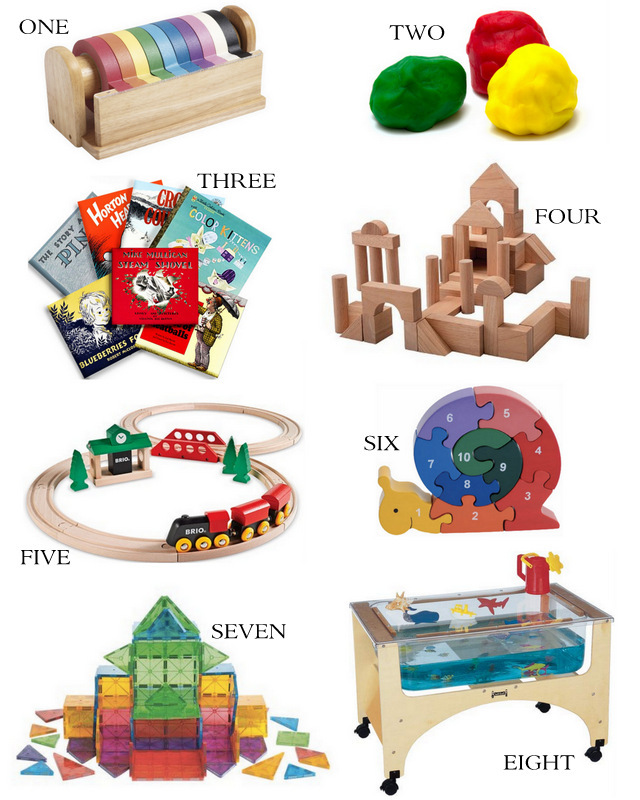 It builds fine motor control and provides endless amounts of open-ended artistic exploration. It's not terribly difficult to cut, making it appropriate for little hands just learning how to properly use scissors. I always plan a few more teacher-led projects around it (like this), but most of the time, my kiddos enjoy using it in their own creative ways (making envelopes with paper, layering designs, or just snipping away). You can purchase craft tape anywhere: I love this big wooden dispenser for both its aesthetics and usefulness. Mix everything in large saucepan over medium heat until dough forms. Remove from heat and carefully knead on flat surface until dough is soft. Feel free to add food coloring or oil extract to change the color/scent. A few drops go a long way! THREE: Books. Okay, so maybe this is cheating, but I couldn't resist. I am a devout collector of children's literature and consider it to be one of the key elements in any early childhood setting. There's not much to say other than you can't go wrong with a pile of great classic picture books. Here are a few personal favorites. Go to the local bookstore and plop yourself down in the children's section. Don't be surprised if hours pass while you get lost in the stories and illustrations. The only way to create readers is to be one. FOUR: Wooden unit blocks. Every classroom or play space needs a set of these. We keep them on an open shelf all year clearly labeled for the children to freely take out and build. I also provide baskets of block accessories such as wooden people, tunnel structures, animals, cars and building toppers. Block-building instills fundamental skills in young learners including but not limited to: architectural & spatial planning, collaboration, fine motor development, balance, design, hand-eye coordination, creative thinking, shape identification, social & language skills, etc. etc. This list is never ending. Here's a classic set, and here's a more wallet-friendly smaller colorful set. For gift-giving, this set is absolutely gorgeous! FIVE: Trains. I'm taking creative liberty here and also lumping in other vehicles such as small cars and trucks. My three and four-year-olds adore trains and regularly set up the most elaborate tracks all over our rug. There are so many great train sets out there, but my favorite is BRIO. (Track set here, assorted trains here). Simple, classic, well-built and beloved. Ikea also sells a basic train set for under $20. Can't beat that. SIX: Puzzles. I have a confession. I dislike doing puzzles. At clean-up time, whenever there's a puzzle that still needs to be put together, I call one of my students over to do it. For whatever reason, I've never had the patience for puzzles, but that doesn't mean I don't recognize their value for my kiddos. Completing puzzles strengthens hand-eye coordination, shape recognition, memory, and problem-solving, among many other things. There are so many amazing, high-quality puzzles available everywhere. I love these chunky 3-D alphabet puzzles for their added challenge and pleasing aesthetic! Additionally, here is one of my favorite Waldorf-style wooden color wheel puzzles. Beautiful. SEVEN: Magna-Tiles. Without a doubt, these are the number one manipulative my students continuously play with day after day, week after week, month after month. Transparent magna-tiles, man. Buy a set, and I promise your kids will happily engage them in creative open-ended play from age two until at least age six. Don't purchase less than the 120-piece set. You'll want them all. EIGHT: Sensory Table/Bin. Young children learn by doing. Humans in general best retain information when engaged with their senses. Sensory tables (or bins) are so awesome because they can be changed whenever you want. Sand, water, rice, dried beans, shaving cream, seeds, goop, etc. etc. I typically update mine every two weeks or so. Sometimes thematically (corn kernels with trucks after a trip to the farm) and sometimes not. Without fail, the sensory table is always a popular center during choice time. In the winter, we've added huge bowlfuls of real snow and droppers with warm water for the kids to explore the concept of melting. In the warmer months, we've made a fresh water "pond" complete with lily pads (laminated green shapes), rubber lizards & frogs, small boats, etc. to investigate the concept of natural habitat. Invest in a good quality sensory table, and truly, the only limit is your imagination. (I'm not kidding: plug in "sensory table" on pinterest and guaranteed you'll get sucked down the rabbit hole). Whew. If you read all that, you deserve a cookie. Happy playing! This is such a great post! I'm definitely getting these for my 4 year old nephew! this is so great, kayla! This is a great list! I never thought of masking tape...love that dispenser but when I follow the link it's a similar (yet different) one. Do you know who makes the one shown? Thanks for sharing Kayla! Hi Susan! I just realized the link is wrong, oops. I updated it to the amazon one (pictured).